The swift implementation of reforms would further strengthen Mexico ́s already solid external economic situation by boosting FDI and reducing dependency on volatile portfolio capital inflows. After 12 years in opposition, the Partido Revolucionario Institutional (PRI), which until 2000 had ruled the country for over 90 years, returned to power after winning the presidential elections in July 2012. However, the PRI failed to gain a majority in Congress in the parliamentary elections. To pursue his reform agenda immediately after his inauguration, President Peña Nieto concluded an agreement to fast-track reforms in certain areas (energy, banking, telecommunications, education and fiscal policies) with two main opposition parties (the conservative National Action Party, PAN, and the leftist Party of the Democratic Revolution, PRD), the so-called ’Pact for Mexico’ (Pacto por México). Violence has flared up considerably and security has worsened since the end of 2006, when former President Calderon’s government stepped up its battle against the well-organised drug mafias. Since then, more than 70,000 people have fallen victim to this struggle. The deteriorating security situation has had an impact on the business environment, discouraging foreign investment that would otherwise flow into Mexico. Moreover, the profitability of many businesses has suffered from threats and violence against the business owners, including the kidnapping of their family members. Since the fall of 2014 concerns over the security situation have increased again, following the disappearance of 43 students in the city of Iguala, which were presumably kidnapped and killed by police forces in league with a regional drug cartel. Public discontent about the way president Peña Nieto handled the situation resulted in country-wide protests and falling approval ratings. 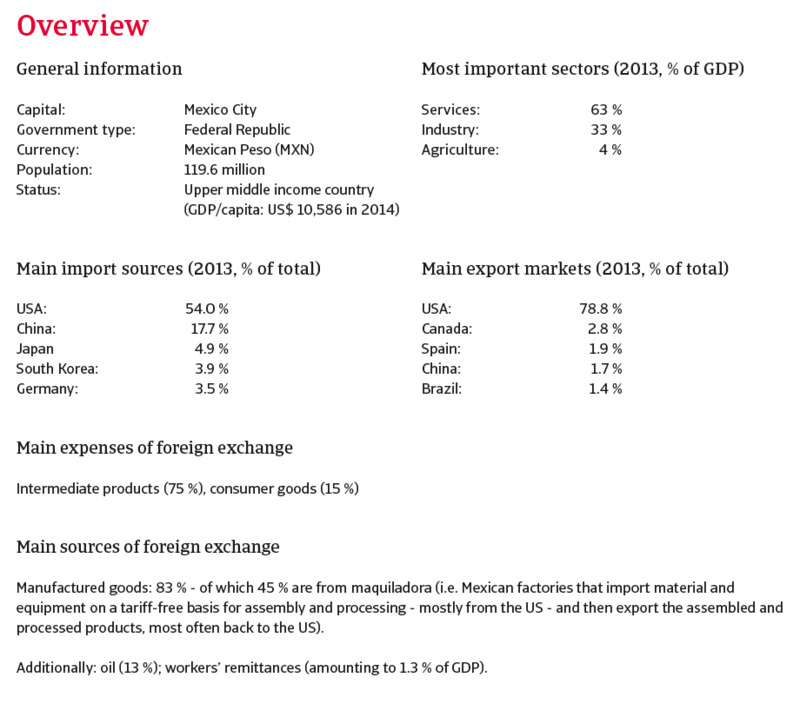 Mexico’s economy is highly dependent on oil (32% of government revenues) and closely linked to the business cycle in the US, which accounts for 79% of exports. Since 1994 GDP growth has been structurally low at an average annual rate of 2.6%, due to low investment and weak productivity. 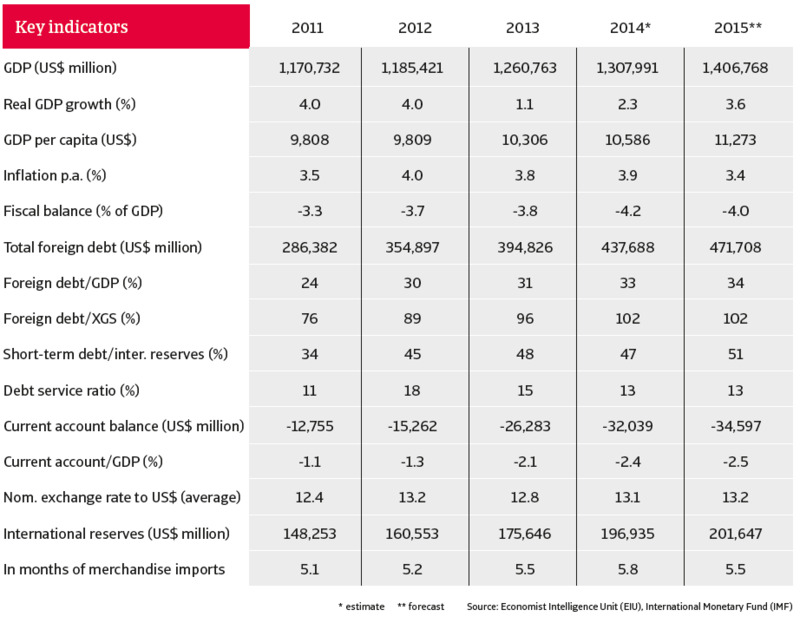 In 2013 and the first half of 2014 the Mexican economy suffered from sluggish domestic demand, leading to low growth rates of just 1.1% in 2013 and 1.7% in H1 of 2014. However, since H2 of 2014 the economic performance has picked up again, benefitting from higher US growth, accommodative monetary and fiscal policies (interest rate cuts and public infrastructure spending), and the passing of some major structural reforms in the telecommunications, energy, fiscal, and finance sectors. 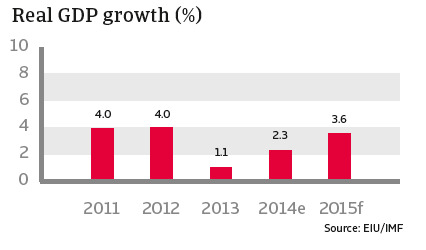 GDP is expected to increase 3.6% in 2015. 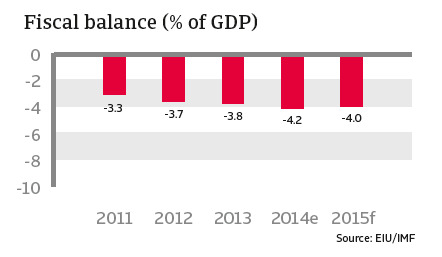 Overall, Mexico’s budgetary policy has been solid, with acceptable public sector finances (government debt of less than 50% of GDP and a budget deficit of 4% of GDP in 2015). However, fiscal flexibility is still constrained by low tax revenues (Mexico has a narrow tax base of only 10%) and the structural decrease in oil revenues, which represent almost a third of public sector income. Nevertheless, oil price hedges limit the effect of the recent decline in oil prices on government finances. 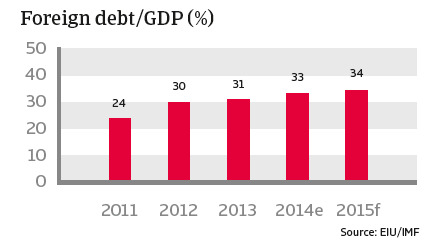 Public debt is expected to peak at 50% of GDP in 2016, thanks to improvements in the fiscal framework and higher tax revenues, following a tax reform passed in 2013. 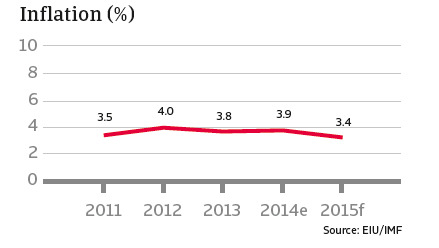 In H1 of 2014, monthly inflation rates decreased and remained within the Bank of Mexico’s target range of 2% - 4%. Together with weaker growth, this prompted the Bank of Mexico to lower its benchmark interest rate to 3.0% in June. Given an inflation expectation of 3.5% in 2015, this leaves room for further monetary easing. In general, Mexico’s banks are well capitalised and liquid, with limited exposure to foreign currency risks. However, they are performing below potential (bank assets as a percentage of GDP stand at just 46%), constraining the credit growth needed to stimulate more private consumption. A cautious lending policy is also restricting financing options for small and medium-sized enterprises. Since 2013 the Peña Nieto administration and the Mexican Congress have passed some comprehensive reforms to overcome the economy´s structural weaknesses: low earnings capacity, limited fiscal flexibility and high dependency on volatile portfolio capital inflows. In the past, reform efforts have often failed because of a lack of political will at the top or support from opposition parties in Congress, impeding economic efficiency and longer-term GDP growth. As a first step, President Peña Nieto concluded an agreement with two main opposition parties to ease the passage of reform laws through Congress. Despite some public protests, an education reform bill was passed in early 2013, followed by bills to liberalise the telecommunications market, to reform the tax system to broaden the narrow tax base, and to open the monopolised electricity market. Mexico is the world’s sixth largest crude oil producer, but proven reserves have shrunk from 34 to 12 billion barrels since 1998. Current production has dropped from 3.4 million barrels per day (b/d) in 2004 to 2.5 million b/d and is expected to decrease further: to 2.1 million b/d in 2015. Although offshore oil fields are said to be twice as large as land-based oil fields, Pemex, the state-owned oil and gas company, lacks the know-how and financial resources to invest in exploration and production, mainly because it pays 90% of its revenues to the state. Pemex therefore urgently needed permission to cooperate with private (foreign) investors for joint exploration, refining and distribution. The major problems in the energy sector and the government’s high dependence on oil revenues underline how important reforms in this field are to the economy. In August 2014 the Mexican Congress finally passed the secondary stage of landmark energy reform. This finally allowed the implementation of the constitutional changes that put an end to Pemex’s 75 year monopoly and enabled foreign companies to invest in the exploitation of offshore oil fields and shale gas. In December 2014 the National Hydrocarbons Commission approved an international tender for 14 shallow-water exploration and production contracts in the Gulf of Mexico scheduled for 2015. Debt service ratio: Moderate: 13% in 2014, even including short-term debt (approx. 33%). Remarks: Relatively high stocks of private short-term portfolio investments (more than 270% of Mexico´s international reserves) make the economy vulnerable to shifts in market sentiment, as was seen in 2013. When the US Federal Reserve then considered ending its programme of monetary easing, financial markets reacted by partly withdrawing or reversing short term portfolio capital that had been invested in Mexican assets in the last few years, leading to higher currency volatility. Nevertheless, the Mexican peso was only temporarily affected by this financial market turmoil. 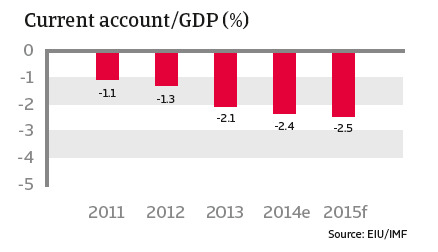 Mexico is resilient to such economic setbacks, underpinned as it is by prudent macroeconomic policies, a flexible exchange rate and solid external balances, with limited current account deficits and external refinancing needs. Its international liquidity is generally good, with enough foreign exchange reserves to cover imports for more than five months. Indeed, the complete picture is even better, as this figure excludes the liquidity potential from a precautionary IMF credit line of USD 70 billion on which Mexico can draw in times of adverse global credit conditions, and which has been recently extended until November 2016. Solvency is also robust: foreign debt ratios are under control (33% of GDP, 102% of exports) and the debt service ratio has dropped to 13%. After the incidents in Iguala, it has become clear that the government must do more to tackle the poor domestic security linked to drug-related violence, and rampant corruption, both of which severely affect the business climate and hamper economic performance by discouraging investors. Mexico has taken an important step with the passing of comprehensive structural reforms addressing its structural weaknesses. However, the degree to which those reforms will have a positive impact on the economy depends on proper implementation (e.g. transparent bidding processes) and on how far the big state-owned electricity and energy businesses are willing to accept competition and an end to their monopolies. There are political obstacles too. In the run-up to mid-term congressional elections in July 2015, popular protests led by leftist parties like the PRD against the liberalisation of the energy sector are expected to increase (the energy reform was one of the main reasons that the PRD left the bi-partisan reform consensus reached with the Pact for Mexico). And although these protests are unlikely to reverse the reforms, they could nevertheless derail their implementation. A comprehensive and swift implementation of the reforms would increase investment and significantly improve the economy´s productivity and competitiveness, raising Mexico´s potential annual GDP growth rate from 3.0% - 3.5% to 4% - 5% in the long term. Lower energy and electricity costs should increase the productivity and profitability of Mexican industries, especially export driven ones like automotive. The swift implementation of reforms, especially in the energy sector, would also further strengthen Mexico´s already solid external economic situation (external liquidity and solvency) by boosting foreign direct investment and reduce dependency on volatile portfolio capital inflows. The current decrease in oil prices is expected to have a negative effect on investments in the exploitation of Mexican shale resources, but investment in other segments of the energy sector, including deep water drilling, is expected to be high in the future – if the reforms are comprehensively implemented.